With room for over 1,500 passengers and 600 cars, the King Seaways comprises a wide range of quality onboard facilities including comfortable cabins, bars, restaurants, cinemas, shopping and much more. Onboard you’ll find comfortable cabins to suit every taste. Whether you’re looking for a value for money cabin or something extra special, you’ll awake refreshed after a great night's sleep. All cabins feature comfortable beds, en suite showers, bedding, towels and wardrobe space. 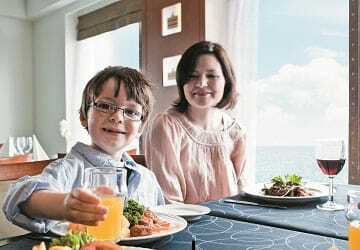 Enjoy a delicious meal and delightful company onboard the King Seaways. With a number of restaurants to choose from there's something to suit every taste. The 7 Seas Buffet serves over 80 dishes each night while the Blue Riband restaurant offers delicious à la carte dining options in a relaxed and contemporary atmosphere. 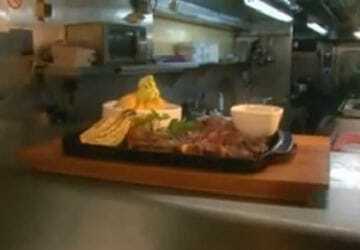 A trip to the Explorer's Steakhouse for a steak cooked just how you like it by the expert chefs. Enjoy a coffee or freshly baked delicacy in the relaxed, modern surroundings of the Bake n’ Coffee Café and the Latitude Café. 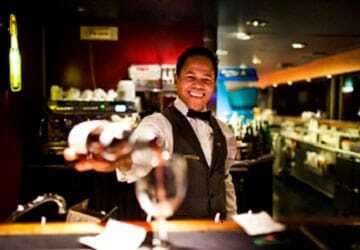 The relaxed atmosphere of the Cafés is perfect in which to enjoy your favourite hot drink or a light meal. 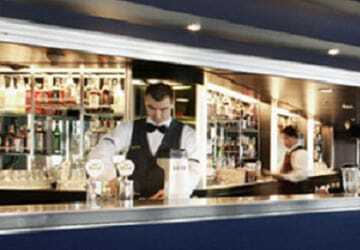 If you fancy a drink onboard then you’ll be pleased to know that there are numerous venues to choose from. If it’s a comfortable setting and pleasant atmosphere that you’re after then head to the Navigators Bar which serves an excellent selection of drinks and quality beers with live music in the evening. The Compass Bar located close to the restaurants is a lounge bar that’s ideal place if you want to relax and enjoy yourself in comfortable surroundings. Pleasant background music is played, and the bar serves an excellent range of wine, beer, cocktails and spirits. If you like music, sports, a few drinks and a friendly atmosphere, the Sports Bar is the place to be or for great views, the top-deck Neptune Sky Bar is a superb place to begin your journey with friends or family, as your ship sails out of port. Enjoy the maritime atmosphere with a beer or long drink in your hand. Shopping at sea is one of the great pleasures of travelling onboard the King Seaways. The Sea Shop features a range of alcohol, chocolate, perfume, cosmetics, toys and fashion wear. Watch the latest blockbusters in the onboard cinema, enjoy a flutter or two in the casino and try your luck at blackjack or on theroulette wheel. There’s also a Wildlife Watching Experience where you can learn about the wildlife of the North Sea as you sail across it. Led by the leading wildlife charity ORCA, the wildlife experience is fun for both kids and adults. The ‘Kidz' Club is a safe and enjoyable play area for children. With a range of activities available, children will be entertained for hours when sailing on the King Seaways. For older children there's a games room with video games, and a cinema too. The King Seaways is wheel chair friendly with lifts to all decks (except deck 5). There's also a choice of specially adapted disabled cabins including 4 Outside (sea view) and 2 inside. Special arrangements cannot be made on the day you travel for requirements that are not requested beforehand so if you have have any special requests then please notify us before booking. Please Note: Whilst we have taken great care in making our King Seaways guide as accurate as possible, onboard facilities, services and entertainment may vary depending on the date and time of year that you travel, facilities mentioned may change without notification and ferry companies reserve the right to operate vessels other than those mentioned at time of booking without prior notification. I would definitely recommend pre booking your meal option on line. The food was excellent and good value. "enjoyable begin and end of summer holidays"
The way to travel by ferry, keeping your own car, not having stress at an airport, is much better, and we enjoy including the trip into the holiday programme, with a nice meal and a relaxing trip to the bar and a good night's sleep (usually, if no noisy parties are next door). So far, we have been quite lucky. Nice end of the holiday too. We went and took the boat as we wished travel through Europe with our car. Boarding and leaving the boat was easy. The staff are kind and are willing to help. Facilities are nearly endless. 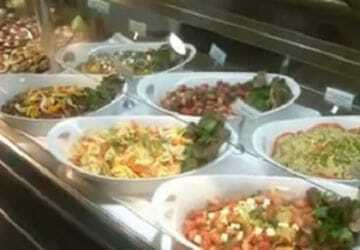 Food is good, downside side is that you need to book you time and tables to eat. So it makes you feel like you part of a school canteen group. The prices are far far too expensive, I personally wouldn't be paying the prices for what you get again. 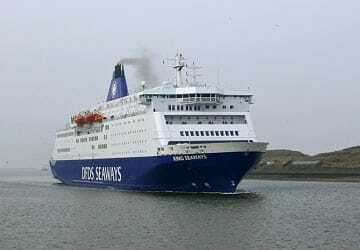 1st time on Dfds and enjoy the entertainment ,had a good sleep woke refreshed .Travelled as a foot passenger . Our crossing on the King Seaways was very comfortable in a Commodore cabin. Attentive stewards were also helpful. We did not eat in a restaurant in the evening having found this very poor value for money on previous occasions but the breakfast served in our cabin in the morning was much more than we had expected with cheese meat and a boiled egg each, as well as bread, croissant fruit and yogurt. Great service from the fantastic polite and helpful staff. Clean well-equipped cabin. All in all a quick smooth crossing. Very good journey. 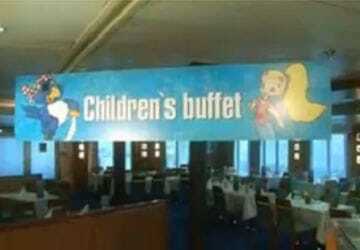 Top class buffet! Nice entertainment. A bit too hot in cabins during night. I used this ship 6 days ago travelling from Newcastle to Amsterdam. 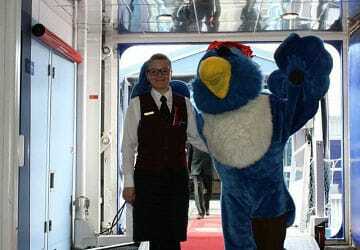 We got our cabin immediately and got the chance to spend some quality time on board. 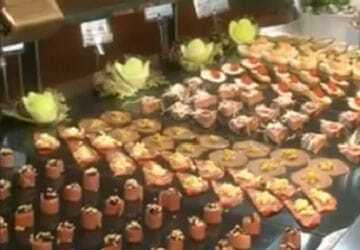 We tried the buffet restaurant and although the price of €35 per person sounds high it is fairly reasonable compared to other companies that you pay the same money for a salad and a main course. Great variety of food overall. Also, for the size of the ferry and the length of the trip having 3 restaurants, 3-4 bars and a cinema is more than enough. The fare price is also really good. For the same length of trip, same car and same type of cabin we paid double price from Ancona Italy to Patras Greece 3 days later. Overall great experience that I would highly recommend to everyone even for a quick weekend to Amsterdam.